Saturday evening marked the first shooting day for The Ultimate Challenge. Our first shoot of the evening took us out to Cottage Grove, where one of our actors (Matthew Feeney, who is playing the detective Howard) graciously offered up his home as a principal location. I don’t have any photos of this because we were in such a hurry to shoot the scene before the sun set that we just didn’t have time to get any stills. The upside to this is that the sun looks the prettiest right before it vanishes, and since we were pushing our schedule so far, we got some disgustingly gorgeous light for our close-ups. 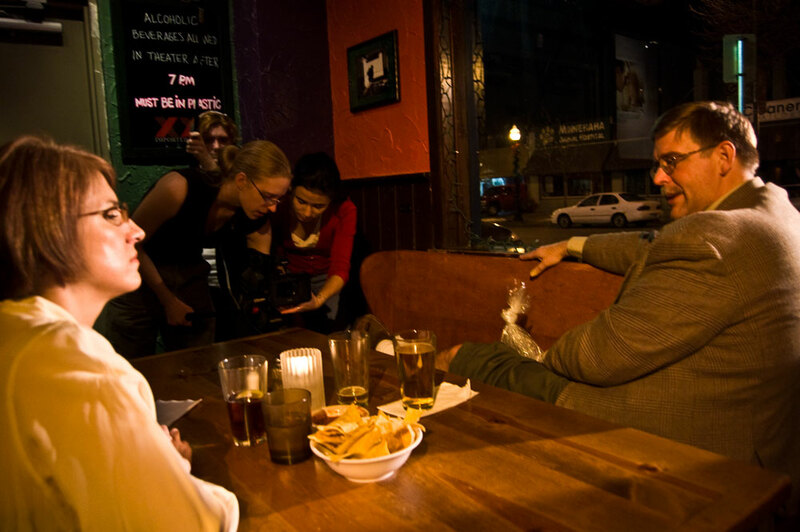 Our second location brought us all the way back downtown to Pepito’s Mexican restaurant, whose owner (also the owner of the Parkway Theater next door) graciously allowed us in to shoot a quick dialogue scene. You know what this means, guys! Eat at Pepito’s! Go see movies at the Parkway! Tell them… well… tell them whatever you want, they probably won’t remember us. But it’s a really cool place, and it made for a perfect location. I’m already having a lot of fun with this production. I get to have an idea and rather than sitting for hours, mulling over the dramatic and narrative ramifications of my urge, I can just shoot it and then play with it on the computer. For instance, when we started shooting, Matthew was just moments out of a stage production in which he took a pratfall and banged up his knee. 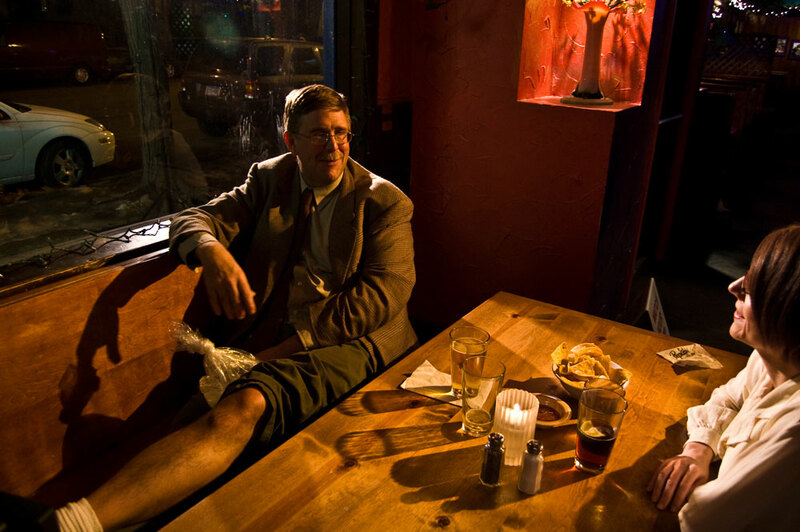 He was icing it between takes at the restaurant, and I decided to put it in the movie as a scene transition. How awesome is that! Rough Cut: The Ultimate Challenge (day 1) from Andrew Gingerich on Vimeo. The reason that restaurant scene sounds so gravy (groovy, but also as smooth and rich as Grandma’s home-made gravy) even though it isn’t at all mixed yet is because we were worried about location noise, and so we wired our actors up with concealed lavalier microphones taped inside their shirts. It also means that actors can talk over each other and since they’re miked separately, they can be mixed on separate tracks in post. This is how Robert Altman did his magic Altman thing, starting in 1970 with M*A*S*H. It’s my new favorite method of field sound recording, and I foresee doing a lot more of it for this movie. Next shooting day is this Saturday, then another one on Sunday, then Monday night, and that’s (theoretically) the end of principal photography! * Much like Winston Niles Rumfoord, I exist as a wave formation that oscillates at random intervals between Fort Collins and Minneapolis, hindered only by the price of airfare and the occasional sunspot. Looks good! And I didn’t think the restaurant scene sounded too gravy. And the guy you got to play Howard does a rather nice job, I think. Best of luck on Saturday and Sunday. I also know it’s incorrect to begin a sentence with a preposition.